Montreal is making a big bet on bicycling with the launch of its own system of public bikes, called Bixi. The Canadian city hopes to set an example in car-loving North America, to get people out of their gas guzzlers and onto two wheels. It’s hard to miss, near the exit of Montreal’s Jean-Talon Metro station: a short walk away, on the corner of Avenue Henri-Julien, there’s a brand new docking station of Bixi, the world’s newest public bicycle sharing system. And I’m lucky: of the 11 bike slots, 10 are empty, but one has a bike. For the next hour, this ‘bixi’ will be mine. Using a credit card, I pay $5 (Canadian) at the docking station’s terminal, for a 24-hour access pass to the system. I agree to a hold of a $160 deposit. The terminal issues a piece of paper with a code, to be keyed in at the bike holder. Click! The bike is released. I adjust the seat to a comfortable position and I’m ready to begin my test ride of the first major public bicycle sharing system in North America. Montreal is betting on its own system of publicly accessible bikes – bicycles that can be hired for a small fee to get around town and then be returned elsewhere for the next user. Inspired by Vélib’, the large-scale public bicycle system in Paris, Montreal hopes to set an example for other cities in car-loving North America, to get people out of their gas guzzlers and onto two wheels. Cyclists at a Bixi station in downtown Montreal. Nearly 300 docking stations of Bixi, a contraction of bicyclette and taxi, have been installed in recent weeks in and around downtown Montreal. There are about 3,000 bikes. Users can go to a website or use a smartphone app to see how many bicycles and open spaces are available at each station, in real time. Interest in the bike-sharing program has been high: in the first 6 weeks, over 175,000 trips were made. Over 4,000 people have purchased monthly passes or annual memberships ($30 and $80, respectively). Holders of those don’t have to pay the $5 access fee for the day. All users pay for time spent riding a bike, though: the first half hour is free, a second half hour costs $1.75. After that, the half-hour rate goes up to $3.50 and $7. Hence, the system is focused on relatively short trips. 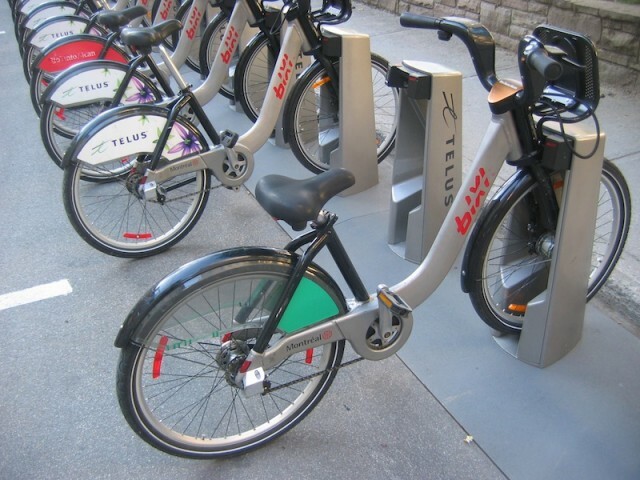 Bixi bikes are solid, silver-coloured bicycles made of aluminum, resembling mountain bikes. They’re equipped with thick tires, three gears, and flashing front and rear lights powered by a dynamo. I look for the nearest bike path. It takes a bit of a detour to get to it, because compared to the Netherlands, bicycle paths are scarce in North American cities. And cycling on main roads without segregated bike lanes is not really recommended, as motorists have little regard for cyclists. “The behaviour of motorists is not always very good towards cyclists, but if we get a critical mass of cyclists in the streets, that will change,” says Alain Ayotte of Stationnement de Montreal, the city’s parking agency running the Bixi initiative. If that seems an unlikely choice, it has advantages over management by a private company (like advertising firm JCDecaux in Paris): the parking agency has access to parking spaces all over the city to place docking stations. It also has a lot of experience with large volumes of financial transactions through its parking meters. Like the parking machines in Montreal, Bixi terminals are powered by solar panels – not for environmental reasons, but for convenience: machines can be placed anywhere, without a need for wires to be laid. The stations can also easily be moved and expanded. In the winter months, when the cold, snow-filled streets of Montreal are not suitable for cycling, the entire system is removed. Another innovation is the lock system of the bicycles at the docks. Bixi bikes are not locked to their front wheel, but to the frame. Ayotte identifies that as an improvement over Vélib, which has suffered from vandalism and theft. “If someone really has the will to steal a bike, there’s always a way,” he says. “But I think that our locking mechanism is more solid than the one in Paris.” No bikes have disappeared yet, says Ayotte – although there has been some vandalism. Bixi bikes are locked to the frame. 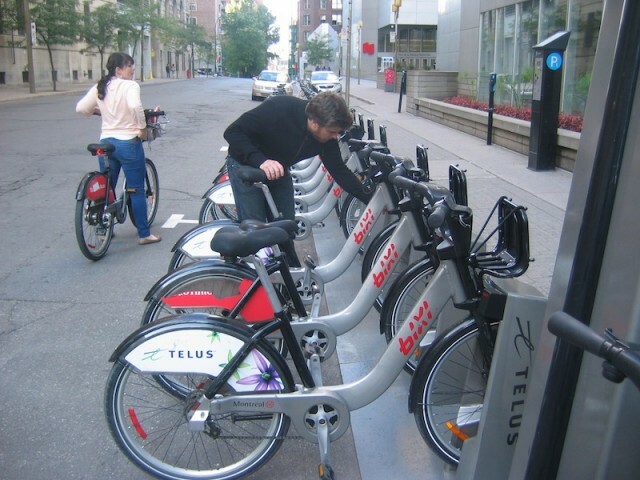 The city of Montreal has invested $23 million in Bixi, the fourth largest public bicycle sharing system in the world. The system will be expanded to 5,000 bikes and 400 stations this summer. The hope is to earn that investment back in 3 years. Moreover, Ayotte hopes the system can be sold to other cities. Toronto, New York, Boston and Los Angeles have all shown interest. Minneapolis wants to order Bixi if it can arrange financing. In London, Bixi is one of five candidates to submit a tender for a bike sharing system. Meanwhile, I am well on my way to downtown Montreal, by the bicycle path along Rue de Brébeuf. I regularly see other Bixi riders approach, with their flashing lights: a man in a suit, two youngsters. One of them observes that you have to peddle a lot harder on one Bixi bike than on another. Through Parc Lafontaine and the bike path along the busy thoroughfare of Boulevard de Maisonneuve, I reach my final destination, near the intersection of Rue Sherbrooke and Rue Saint-Marc. Fortunately, there are some open spots – if there aren’t, you have to find another docking station. I push the bike into place until a green light comes on. All done. The bill will appear on my credit card statement. Now I just have to get home.